ACDelco offers a full range of chemical products to protect, enhance and maintain your vehicle. From adhesives to sealants, additives, lubricants, oil and appearance care products, ACDelco has the chemical products needed to keep your vehicle looking and performing great!.. Diesel Exhaust Fluid (DEF) is one of the key elements of the Selective Catalytic Reduction (SCR) process used by Diesel Engine builders to meet EPA 2010 regulations. BlueDEF® is a nontoxic solution of 67.5% purified water and 32.5% ultra pure automotive grade urea. BlueDEF® is not a fuel or fuel additive. Instead, when injected into the exhaust stream and passed over a catalyst, BlueDEF® helps con..
Today CAM2 offers a wide array of premium quality products that includes brake fluids, power steering fluids, greases and gear oils, aerosol and liquid pour chemicals, antifreeze, washer fluid, and an extensive and complete line of automotive, commercial and industrial lubricants. We also offer an extensive line-up of our premium quality lubricants in quarts, gallons, pails, kegs, drums, and..
CAM2 SUPERPRO MAX Motor Oils are fully licensed to meet or exceed the latest automotive manufacturers’ requirements of API SN and SN-RC. CAM2 SuperPro MAX 5W-20, 5W-30, and 10W-30 are fully licensed to meet and exceed ILSAC GF-5 requirements for use in passenger car, SUV and light duty truck gasoline engines. 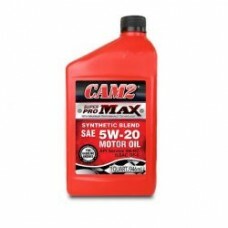 CAM2 SuperPro MAX Motor Oils show improved high temperature deposit control, oil consumpt..
CAM2 SYNAVEX is a premium quality, full synthetic engine oil formulated from selected superior base oils and advanced high performance engine oil additive technology. 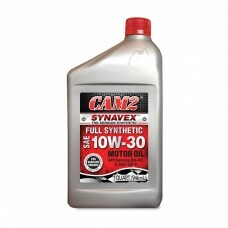 CAM2 SYNAVEX full synthetic engine oil is formulated with low friction additives to help improve fuel economy and to provide outstanding engine protection. CAM2 SYNAVEX meets or exceeds the latest American Petroleum Institute (..
Delo 400 LE SAE 15W-40 is a mixed fleet motor oil recommended for naturally aspirated and turbocharged four-stroke diesel engines and four-stroke gasoline engines in which the API CJ-4 service category and SAE 15W-40 viscosity grade are recommended.Delo 400 LE SAE 15W-40 helps keep rings clean and free for maximum combustion pressure and minimal wear. Delo 400 LE SAE 15W-40 minimizes valve and pis..
From automotive motor oils to turbine oils for industry, Gulf produces a line of high quality lubricants engineered to surpass today's tough equipment manufacturer standards. Gulf lubricants are made from premium-quality base oils and fortified with advanced additives to provide maximum performance. Gulf lubricants are compounded and blended under the industry's tightest quality control requiremen..
Genuine Honda Transmission Fluid is formulated exactly for the Honda Transmission.Advanced wear protection to reduce wear and increase service lifeOptimum shift qualityReduced friction helps keep transmission sludge free..
Johnsen’s brand has been a leader in the automotive aftermarket car care business since 1928. 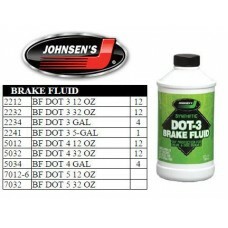 Starting with packaging brake fluid, Johnsen’s has always been there to answer the needs of the automotive car care consumer. Johnsen’s has been a leader in responding to the changing needs of the automotive aftermarket with many innovations over the years. We offer a complete line of automotive fluids, a..